The charming destination for our excursion is the wonderful city of Amsterdam, the most densely populated city and capital of the Netherlands, well-known and loved across the world for its canals which extend for more than 100 km, approximately 90 islands and 1,500 bridges which have earned it the name of, "Venice of the North" and its status as a UNESCO world heritage site. The city is the commercial capital of the Netherlands and one of the main financial hubs in the world. One of the city's essential features is the charming canals that cross the city and the houses with their unique architecture and the distinctive gables that frame them. Since it was formed, Amsterdam has become a flourishing economic and cultural hub and, since the time of Rembrandt, the most important Dutch painter, it has also been considered a prestigious artistic centre. Indeed, today the city is famous for its wealth of museums, most notably the Rijksmuseum, the Van Gogh Museum and the Stedelijk. 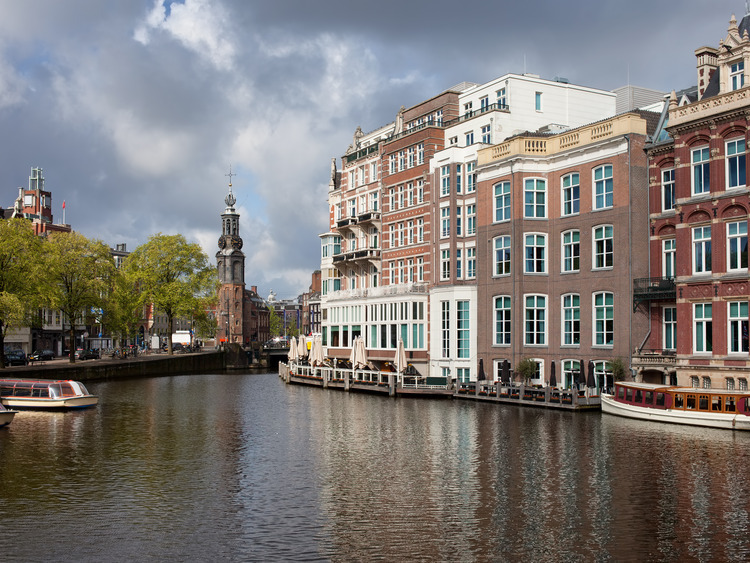 Amsterdam is also renowned for being the ideal city for business and purchases. You can find practically everything here, ranging from bargain items at the typical flea markets to typical Dutch products like cheese and clogs, and from precious glassware and magnificent Delft ceramics to the beautiful varieties on offer at the famous flower market. We leave the cruise terminal and head to the city centre for our sightseeing tour. The first building that we note is the majestic Mint Tower (Munttoren), a Renaissance-style bell tower. Right in the centre of the concentric semicircular structure of canals lies the imposing Central Station building, built in the late 19th century on three artificial islands. The Schreierstoren building is much older, built as a defensive tower in 1481, part of the city's medieval fortifications. The last of its kind remaining, it is one of the oldest buildings in Amsterdam. After the sightseeing tour, the coach will take us to one of the most famous and most frequented museums in the city, the Van Gogh Museum, where we will be free to roam on our own. The museum houses the largest collection of Vincent Van Gogh works in the world, including some of his masterpieces such as "Sunflowers", "Blossoming Almond Tree" and "Vincent's Bedroom in Arles", as well as a total of 200 paintings, 400 drawings and 700 letters. We will have a look round the museum shop which sells posters, bags, books and souvenirs inspired by the life and works of Vincent Van Gogh. This tour is for guests whose flight leave after? 16.00hrs.